by fiji internationl presented by fiji airways. The Fiji International present­ed by Fiji Airways will have the support of Fiji Airports with the announcement that they will continue their partnership in 2018. “Nadi International Airport has been internationally recognised as one of the World’s Most Improved Airports by Skytrax. It has under­gone a complete transformation with the successful completion of the terminal upgrades last year. Nadi International Airport is now the pride of Fiji and the Pacific. We look forward to welcoming our international guests as the official Airport of the tournament,” said Fiji Airports executive chairman Faiz Khan. Professional golfers from around the world have been welcomed to the tropical paradise of Fiji by Fiji Airports and have always been made to feel welcome as soon as they step off the plane. The comple­tion of the terminal modernisation project at the Nadi International Airport now adds to the first class welcome golfers and tourists alike experience. “The Fiji International presented by Fiji Airways is now in its fifth year and attracts some of the best players from Australia, New Zea­land, Europe and Asia, this year we’ll welcome South African golf­ing legend Ernie Els to Fiji for the first time,” said Matt Porm, Direc­tor of Commercial for the Fiji Inter­national presented by Fiji Airways. “Fiji Airports has done an amaz­ing job with its redevelopment of Nadi International Airport. The new facilities are truly market leading and the airport has re-es­tablished itself as Fiji’s gateway to the world. To be held from 2-5 August 2018 the Fiji International presented by Fiji Airways will be played at Natadola Bay Championship Golf Course which boasts breathtaking views of the Coral Coast and is home to the Natadola Beach Land Estate. 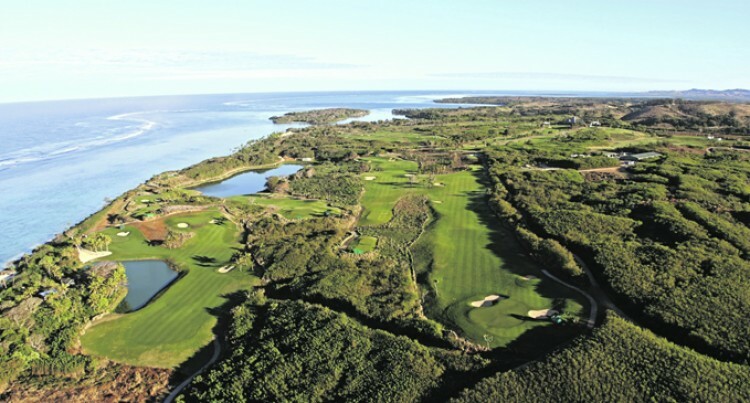 Enticed by the tropical destina­tion, the Fiji International present­ed by Fiji Airways has attracted some of the world’s best golfers since its inaugural staging in 2014 including Fijian hero and three-time Major champion Vijay Sin­gh, 2017 champion Jason Norris, 2016 champion Brandt Snedeker, 2015 champion Matt Kuchar, 2014 champion Steven Jeffress, Steven Bowditch, Boo Weekley and Nick Price. This year’s tournament is set to feature four-time Major champion and Captain of the International Team for the 2019 Presidents Cup, Ernie Els. In 2018, the Fiji International pre­sented by Fiji Airways continues to have a global presence confirming its position as an integral tourna­ment in the South Pacific region, with the tournament being tri-sanctioned by the European Tour, ISPS HANDA PGA Tour of Austral­asia and Asian Tour. A Pacific paradise, the Fiji In­ternational presented by Fiji Air­ways also boasts some of the most unique hospitality options in world golf with the par-3 8th hole provid­ing the perfect vantage point to watch the golf, whilst socialising on the beach. More than just a golf tournament, the Fiji International presented by Fiji Airways aims to leave a lasting legacy for golf in the Pacific region, with the PGA of Australia support­ing initiatives to introduce and grow the game in Fiji. Owned by SEL and the PGA of Australia, the Fiji International presented by Fiji Airways is proud­ly supported by the Fijian Govern­ment, Tourism Fiji and the Inter­Continental Fiji Golf Resort & Spa as the official resort of the tourna­ment. FijiFiji Internationl Presented By Fiji Airways.